Dede Ayew rose high above Coloccini to head home his 2nd Premier League goal. Though he played only 71 minutes in his second English Premier League game, Andre Dede Ayew was on target again in Swansea City’s 2-0 victory over Newcastle United. This is the second goal of the deputy Black Stars captain “in as many games” as his club put it. 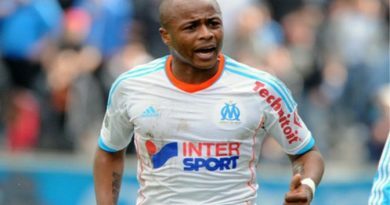 Ayew scored the Swans’ first Premier League goal for the 2015/2016 season last week in his side’s 2-2 draw with champions Chelsea FC. 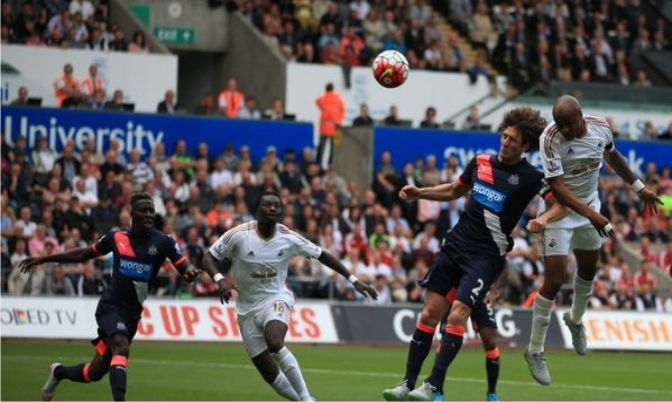 Saturday’s match was the first game at the Liberty Stadium, Swansea’s home ground. Bafetimbi Gomis, the man who convinced Ayew to join the Jacks, opened the score in the 9th minute to end the first half 1-0. Ecuadorian Jefferson Montero picked up where he left off last week, dominating his opponents. After making sure his side had the numerical advantage in the dismissal of Newcastle’s Daryl Janmaat, Montero got a cross in for Ayew to head home Swansea’s second. The 2009 FIFA U-20 World Cup winner rose high above Fabricio Coloccini to make it 2 goals out of 2 games in the Premier League. Swansea’s next match will be against Sunderland at the Stadium of Light on Saturday, August 22 and Ayew is expected to play a key part.